Replace timing belt every 80,000 miles. Replace tensioner pulley every 160,000 miles. NOTE: Volkswagen UK recommend the timing belt is replaced every 4 years if the replacement mileage is not reached. CAUTION: This engine has been identified as an INTERFERENCE engine in which the possibility of valve-to-piston damage in the event of a timing belt failure is MOST LIKELY to occur. A compression check of all cylinders should be performed before removing the cylinder head(s). Auxiliary drive belt tensioner locking pin – Volkswagen No.T10060. Camshaft sprocket locking tools – Volkswagen No.3359. Camshaft sprocket holding tool – Volkswagen No.T10172. Crankshaft sprocket locking tool – Volkswagen No.T10050/T10100. Tensioner pulley locking pin – Volkswagen No.T10115. Two-pin wrench – Volkswagen No.T10020. Auxiliary drive belt. Use tool No.T10060 (if necessary). Exhaust pipe from auxiliary heater. Slacken lower coolant pipe bracket bolt. Timing belt centre cover  . Disconnect fuel supply and return pipes.NOTE: Supply pipe coloured black and return pipe coloured blue. Remove fuel filter. DO NOT disconnect pipes. Disconnect coolant expansion tank top hose. Remove coolant expansion tank. DO NOT disconnect hoses. Turn crankshaft clockwise to TDC on No.1 cylinder. Ensure window in each camshaft sprocket at 12 o’clock position  . Ensure timing mark aligned with notch on camshaft sprocket (CA2) hub  . Notch located behind camshaft sprocket teeth. Lock crankshaft sprocket.NOTE: There are two types of crankshaft sprocket. Type A: Use tool No.T10050 [A] . Type B: Use tool No.T10100 [B] . NOTE: Ensure lug of crankshaft sprocket locking tool located in oil seal housing. Ensure timing marks aligned  . Remove RH engine mounting.NOTE: Engine may need to be raised/lowered slightly. Slacken bolts of each camshaft sprocket  &  .NOTE: Slacken bolts until sprockets can be moved within slotted holes. Lock camshaft sprockets. Use tool No.3359  &  . Turn tensioner pulley anti-clockwise until locking pin can be inserted  . Use tool No.T10020  . Insert locking pin in tensioner pulley  . Tool No.T10115. Turn tensioner pulley fully clockwise until it reaches stop  . Use tool No.T10020  . Lightly tighten tensioner pulley nut  . Remove RH engine mounting bracket.NOTE: RH engine mounting bracket can only be removed with timing belt slackened. Remove timing belt, starting at water pump sprocket.NOTE: Mark direction of rotation on belt with chalk if belt is to be reused. NOTE: Engine must be COLD. Fit new guide pulley (G1). Tightening torque: 20 Nm. M10: 40 Nm + 90°. Use new bolt. M12: 90 Nm + 90°. Use new bolt. Ensure camshaft sprockets locked with tools  &  . Ensure crankshaft sprocket locking tool located correctly [A] or [B] . Ensure tensioner pulley locking pin inserted  . Tool No.T10115. Ensure tensioner retaining lug is properly engaged  . Turn camshaft sprockets fully clockwise in slotted holes.NOTE: Sprockets should turn freely without tilting. 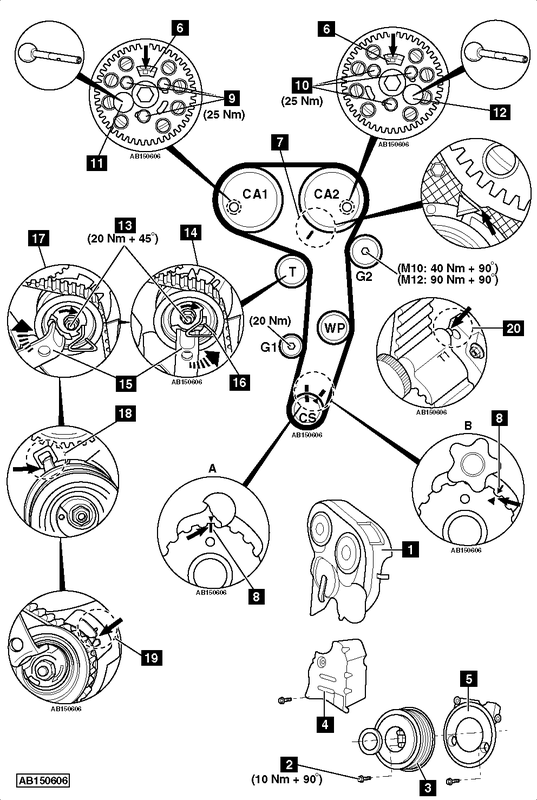 Fit timing belt in clockwise direction, starting at crankshaft sprocket.NOTE: If reusing old belt, observe direction of rotation marks on belt. Ensure belt is taut between sprockets on non-tensioned side. RH engine mounting bracket lower bolt. Use new bolt. NOTE: Engine may need to be raised/lowered slightly. Remove locking pin from tensioner pulley  . Tool No.T10115. Turn tensioner pulley slowly clockwise until pointer aligned with notch  . Use tool No.T10020  .NOTE: Ensure tensioner pulley nut does not turn  . Hold tensioner pulley. Use tool No.T10020  . Tighten tensioner pulley nut  . Tightening torque: 20 Nm + 45°.NOTE: As tensioner pulley nut is tightened, the pointer may move clockwise 5 mm maximum. DO NOT adjust position of tensioner pulley. Timing belt will settle once run in. Hold camshaft sprocket (CA1). Use tool No.T10172.NOTE: Ensure belt is taut between sprockets on non-tensioned side. Tighten bolts of each camshaft sprocket  &  . Tightening torque: 25 Nm. Camshaft sprocket locking tools  &  . Crankshaft sprocket locking tool [A] or [B] . Turn crankshaft slowly two turns clockwise until just before TDC on No.1 cylinder. Fit camshaft sprocket (CA1) locking tool while slowly turning crankshaft to TDC  . Tool No.3359. Ensure camshaft sprocket (CA2) locking tool can be inserted  . Tool No.3359. Ensure crankshaft sprocket locking tool can be inserted easily [A] or [B] . Tool No.T10050/T10100. Ensure tensioner pulley pointer aligned with notch or 5 mm maximum to the right of notch  . Remove crankshaft sprocket locking tool [A] or [B] . Slacken camshaft sprocket (CA1) bolts  . Ensure camshaft sprocket (CA1) locked with tool  . Tool No.3359. Turn crankshaft until camshaft sprocket (CA2) locking tool can be inserted  . Tool No.3359. Slacken camshaft sprocket (CA2) bolts  . Lock crankshaft sprocket. Use tool No.T10050 [A] or T10100 [B] . Turn crankshaft anti-clockwise until lug of locking tool just passes hole in oil seal housing  . Turn crankshaft clockwise until lug of locking tool and hole aligned. Remove camshaft sprocket holding tool. Remove camshaft sprocket locking tools  &  . Fit RH engine mounting bracket upper bolts. Use new bolts. Tighten crankshaft pulley bolts  . Tightening torque: 10 Nm + 90°. Use new bolts.